When a piece of P-type Semiconductor material is combined with N-type material then the junction of the two materials is known as a P N Junction. The P N junction forms a voltage-polarity-sensitive resistance. Fig. 10.1 shows the positive element of the power source connected to the P-type material and the negative element of the power source connected to the N-type rnaterial. The negative charges, known as Electrons are forced towards the P N junction in N-type material. Whereas the positive charges, known as Holes, are forced toward the P N junction in P-type material. The meeting of these two opposite charges effectively neutralizes the junction. The result is a very low resistance across the P N junction. This type of junction with its voltage polarity is called a forward biased junction. The forward-biased P N junction exhibits a very low resistance. When a voltage is applied to this junction, it forces a current flow through the semiconductor device. 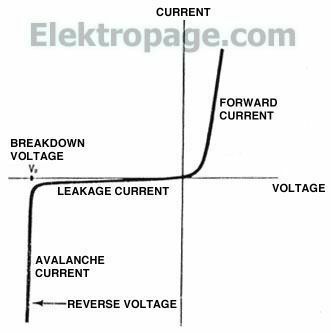 Since the junction has a relatively low resistance, a low value of voltage will permit a relatively large current flow. When a silicon semiconductor junction is forward biased the voltage _d_r_o_p_oecurring across it amounts to about 0.7 V. Similarly, a germanium P N Junction has a voltage _d_r_o_p_of about 0.2 V, when it is forward biased. When the polarity of the applied voltage is reversed, the charges in both the P-type material and N-type material rnove away from the P N junction. They move towards the connections to the power source. This forms an area at the P N junction that has a lack of charges. The P N junction becomes an insulator under these conditions. This is known as a reverse-biased junction. The internal resistance of this junction is extremely high. There is little, if any current flow through the P N junction when it is reverse biased. The voltage _d_r_o_p_that develops across the junction is very high under these conditions. Diode Characteristics: The semiconductor has certain basic characteristics. The fundamental characteristics are (1) Forward current and (2) Reverse voltage. Forward Current: Describes the maximum quantity of current that can safely be allowed toflow through the diode and its junction. Reverse Valtage. Reverse voltage is a term applied to conditions existing when the diode is reverse biased. The diode exhibits a very high resistance when it is reverse biased. The voltage _d_r_o_p_developed across its terminals is also very high. The diode has a breakdown voltage rating. This rating is the maximum voltage that can be applied to the diode when it is reverse biased without its insulation breaking down. When the insulation of the diode breaks down, it becomes a conductor. Diode Elements and Symbols: The diode has two elements. The two elements of the diode are known as the anode and the cathode. The schematic symbol for the solid­state diode is shown below. When the diode cathode has negative voltage charge on it and the anode has a positive voltage charge, the diode is forward biased. The internal resistance of the diode is very low. It is of the order of 1 on to ab out 1000n for low current rated diodes and less for diodes rated 1 A or higher. 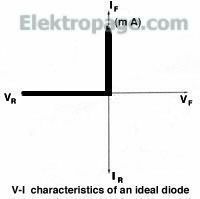 When a voltage is applied to the diode´s element the polarity of the applied voltage determines the internal resistance of the diode. When the polarity of the voltage is reversed, the negative terminal of the source is applied to the anode of the diode. The diode is reverse biased under this condition. The internal resistance of the diode becomes infinitely high. a) The device may have inherent weakness due to improper manufacturing. b) Failures can be caused by misuse. d) Electrical interference is one of the causes of premature failures. voltage is applied to the diode. If the diode is forward biased the resistanee reading will be under 5 KQ. The speeifie value depends on the range setting of the ohmmeter. Usually, a range of Rx1 KQ is used for this test. If the diode is forward biased, the voltage at the test leads of the ohmmeter will produee a current flow and the meter will read a resistanee value. When the test leads, or the diode leads, are reversed, the diode is reverse biased. Its internal resistanee is very high, but when current flow oeeurs it gets low under the eondition when the test leads are eonneeted. The ohmmeter will indieate an infinitely high value of resistanee. In many tests the ohmmeter will not indieate any reading of resistanee. The diode test is therefore a test of its resistanee under forward and reverse­biased conditions. If the diode shows the similar resistanee values in both direetions, the diode has failed. Light Emitting Diode The circuit symbol is .